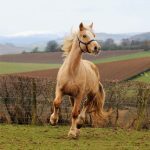 TRESORYA WELSH COBS LOOKS FORWARD TO THE ARRIVAL OF A PALOMINO MARE WITH SOME NEW BLOODLINES. 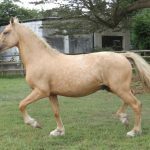 We are very much looking forward to the arrival of a new palomino broodmare Draghi Lily of the Valley. 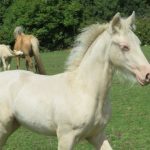 We have been wanting to introduce some new bloodlines, and Lily is by Janton Renegade and out of Crabbiesden False Promise by Medley Maxxy’s Pride, and also includes some more Llanarth with Llanarth True Briton and Llanarth Iarlles in her bloodlines. 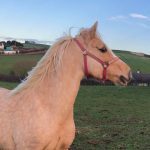 Lily is coming from Scotland and is at Azgard Welsh Cobs Stud where she will be covered by one of their lovely stallions before leaving. Very exciting, and looking forward to her safe arrival !!! Tresorya Golden Glow loaded well and travelled to his new family home today. He is such a friendly boy and really loves people. He is going to a lovely new family home and I think he will be very spoilt. We wish ( Pistachio – his stable name ) and his new owner a great future together. 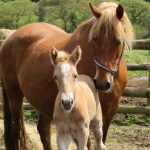 AN EARLY NEW ARRIVAL AT TRESORYA- WHAT A GREAT START TO 2019!! 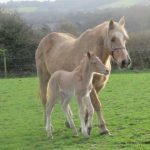 What an exciting day today at Tresorya Welsh Cobs, as we welcome a gorgeous palomino filly by Tresorya Rhodri Rhun and out of Paith Tywysoges Terfynol Replica, by Derwen Replica. 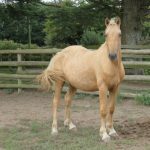 Have been really hoping for a Palomino Filly from this beautiful mare! A great start to the New Year !!! A break now before the other foals arrive!! 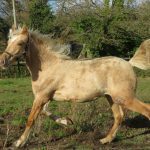 Both Welsh Part-breds Palomino Tresorya Cornish Legend and Cremello Tresorya Halley’s Comet left Tresorya this morning and are now on their way to a lovely new home in Scotland. Legend is by Tresorya Rhodri Rhun and out of W.P-B.R. Tresorya Chantilly Lace. Bloodlines include Thorneyside, Nebo and Parc . Comet is by W.P-B.R. Tresorya Gwynhaf Llawen ( now at a stud in Switzerland ) Dam is W.P-B.R. Tresorya Hafwen. Bloodlines include Pipersgreen, Nebo and Parc. Wishing them well with their lovely new owner! Tresorya Rhianna and Tresorya Heidi have now been weaned. 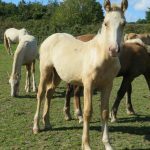 Both Full Welsh Cob Section D and by Tresorya Cornish Cream. Looking very cosy now the cold spell of weather has arrived!! 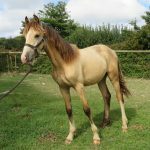 Buckskin Yearling Colt Tresorya Caramac left Tresorya today for his lovely new family home. He loaded and travelled well, and is settling in. 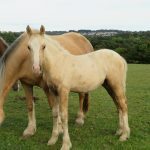 He was a late foal born in August last year, but is gradually catching up. 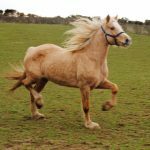 Caramac is by Cremello Stallion Tresorya Cornish Cream and out of Talebolion Catia by Supreme Champion Hwylog Diplomat. 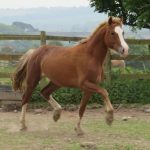 We wish him well in his new home and hope both Caramac and his new owner have a great future. W.P-B.R. Tresorya Rio De Janeiro ( Rio ) left Tresorya for his new home today. He loaded well for his first journey away from the Stud. He is growing nicely – his sire is W.P-B.R. Tresorya Gwynhaf Llawen , now at a stud in Switzerland, who is by Tresorya Llyw Sulien. His Dam is Cyfyng Rhian , her G.Sire is Glanvyrnwy Coming King. Wishing both Rio and his new owner a great future. Another busy day at Tresorya as W.P-B.R. Tresorya Phoenix left for her lovely new home. She had a long journey, but travelled well and is settling in well too. Wishing her well with her new owner. Dam: W.P-B.R. 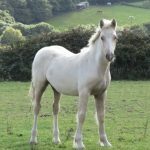 Tresorya Tegan Annwyl – Nebo and Parc bloodlines. Tresorya Prince Charming loaded well this morning to go to a lovely new home. He is a very smart colt with great potential and we wish him well with his new owner. His sire is Tresorya Rhodri Rhun by Brynithon the Business, G. Sire Thorneyside the Terminator. His Dam is Paith Tywysoges Terfynol Replica by Derwen Replica. 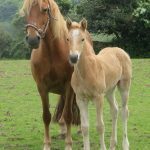 All of the weaned foals are doing well – Settled nicely to the change of routine and growing well. Six foals have been micro chipped today and were very good. Mums have settled too. Now only two left to wean. 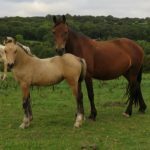 Two fillies – Tresorya Rhianna and Tresorya Heidi.